The road to self-driving cars is long and winding. According to the latest data from Canalys, despite industry hype, only 3% of new passenger cars sold in the US in Q3 2018 had semi-autonomous driving functionality. But the outlook is more positive. “Canalys estimates that Tesla made up a third of the semi-autonomous passenger car market in the US in Q3 2018, thanks to the success of the Tesla Model 3 with Autopilot. 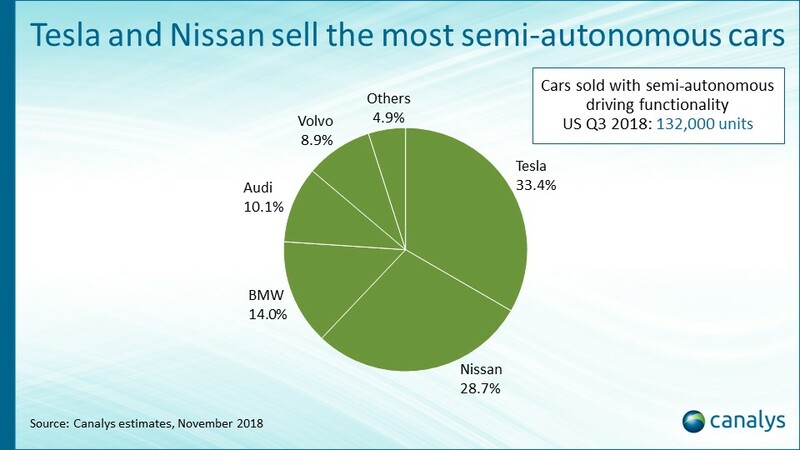 Nissan was second due to its inclusion of ProPilot as an available feature in the new Altima, Leaf and RogueThis puts Tesla and Nissan ahead of BMW, Audi, Volvo and other automotive OEMs. Automotive OEMs must offer advanced features in more passenger cars, including more affordable vehicles. The market is growing, albeit slowly. Uptake of passenger cars with the semi-autonomous driving feature will continue to increase steadily over the next two years. Canalys estimates the feature will be in 10% of new passenger cars sold in the US in 2021. Penetration will then ramp up as the cost of lidar and other key components falls, enabling more automotive OEMs to include the feature in more vehicles.